Having Snacking Chocolate on hand has helped me overcome my chocolate cravings and makes a perfect movie snack. Filled with dark chocolate, dried fruits, and toasted nuts helps you stay on track with your clean eating goals! Thanks to my recent addiction to dark chocolate bark, the spandex in my jeans is screaming a little louder than usual these days. While discussing the unfortunate state of my waistline with a friend of mine, the terms Fat Tuesday and Mardi Gras were overheard by my boys. They are like little sponges and hear EVERYTHING I say and then repeat it at the most inopportune and inappropriate times. Too bad they can’t hear “clean your room or take out the trash when I say it!” Since they didn’t know what Fat Tuesday and Mardi Gras were, they asked me over breakfast, and after many weird and embarrassing questions, the conversation soon turned to Lent in my attempt to bring the discussion to a more wholesome subject. During Lent, many people practice fasting or eliminating a “luxury” as a form of penitence. Thinking that I need to give my waistbands a little reprieve, and atone for more than a few sins, I decided to give up dark chocolate for 40 days. It seems like a small sacrifice to some, but let me assure you this will be no easy task for me. Don’t think me spiritually shallow because I am giving up a snack food, I am also observing other aspects of Lent but since this is a food blog, there is no need to talk about those here and now. Since starting the practice of eating Paleo last year, I can’t really tolerate refined sugar or dairy, so dark chocolate is my ONE way to get a sweet treat (other than the fresh fruit of course) that actually seems like a splurge. Let’s just say that 8 pieces throughout the day, every day, adds up to trouble, hence the waistbands and their vocal protests. My kids gave up candy and their Xbox as part of their observance. Mine really does seem small, doesn’t it?!?! 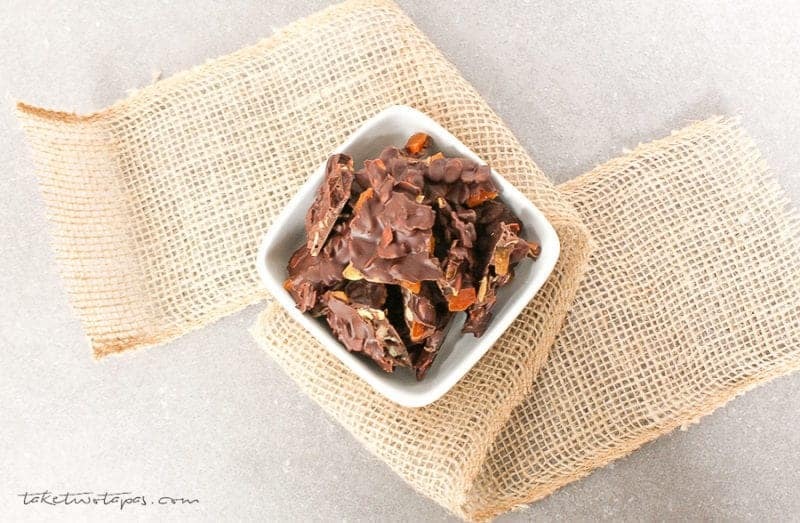 My abstinence from this delicious snack doesn’t have to hinder your love affair with dark chocolate. 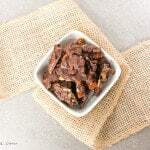 With this recipe for snacking chocolate, I will try and get you hooked on that very same chocolate bark so you will feel my emotional struggle. You will probably have more self-control and willpower than I ever will, so you can enjoy this snacking chocolate safely! This Snacking Chocolate is also an all-inclusive snack food as it contains sweet, salty, crunchy, and creamy and is great for eating during the movies if you are the type that “sneaks” food in to avoid those pricey and gross concessions offerings like me. 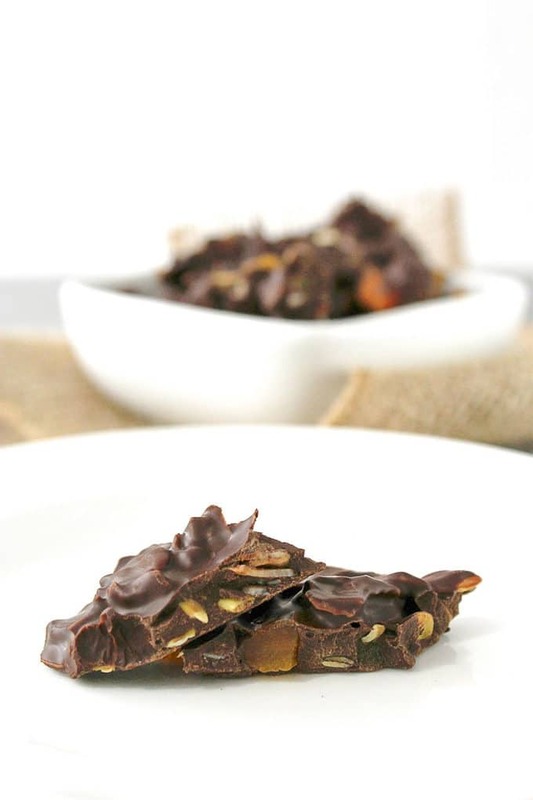 This dark chocolate snacking chocolate bark has some great add-ins that make it an all-inclusive snack! Make sure all your mix-ins are chopped into small pieces. Melt your chocolate in a double boiler or the microwave. I like the double boiler because I tend to scorch chocolate in the microwave, especially if it is low on cocoa butter! When your chocolate is melted all the way, stir in your add-ins. Toss to make sure they are incorporated evenly. Spread out on a cookie sheet lined with parchment paper or a silicone baking mat. Let cool. I put mine in the refrigerator to speed up the process but you don’t have too. Store at room temperature until ready to eat. This chocolate looks absolutely scrummy! What a tasty bark! I love the fruit/nut/coconut combo in this! Thanks Sarah! I love switching it up with what ever fruit and nuts I have on hand because I do run out of the ones that I really love like almonds! I love that you put pumpkin seeds in this. I can just imagine how good that would be, with the saltiness of the seeds alongside the sweetness of the chocolate. Yum! I love pumpkin seeds too! The salty sweet combo is always a favorite of mine too! This is perfect for a between-meals snack! Thanks for sharing! This looks absolutely amazing. Nothing beats chocolate for snacking on. I love the additions in this one. I’m a sucker for chocolate mixed with coconut. Oh this snacking chocolate looks absolutely divine! Thanks Melanie! I certainly eat my fair share of this! I love this idea. Chocolate is my weakness! I think I am pretty good with my sugars but if a chocolate craving hits me, I am toast. I cannot wait to give this a try! This sounds divine! I love all of the mixins, coconut and apricot are two of my favorites! Definitely making this soon! MMMM, I love the fruit and seeds in the chocolate. I don’t eat refined sugar, but this kind of snack is hard to resist. don’t you DARE get me started on that delicious looking stuff! Thanks Dorothy! I am totally addicted to it! I started it just as a movie snack but now keep a tin of it around all the time. I consider it healthier snacking than my old candy bars so I sometimes eat a few pieces at a time:) Thanks for reading!